BDC 600 Reticle: Developed specifically for the trajectory of the .223 Rem /5.56 NATO round with 55-grain polymer tip bullet, the BDC 600 reticle offers shooters unique open circle aiming points and hash marks from 100 to 600 yards. Fully Multicoated Optical System: Provides up to 98% light transmission and maximum brightness from dawn to dusk. 100-yard Parallax Setting: Eliminates parallax for precise shooting. Generous, Consistent Eye Relief: Keeps your brow safe—even with the heaviest recoiling cartridges, lightweight rifles, and severe shooting angles. Precise, 1/4-MOA Hand-turn Tactical-Style Turrets: Positive click reticle adjustments get you zeroed in quicker and maintain your setting—even with repeated recoil. 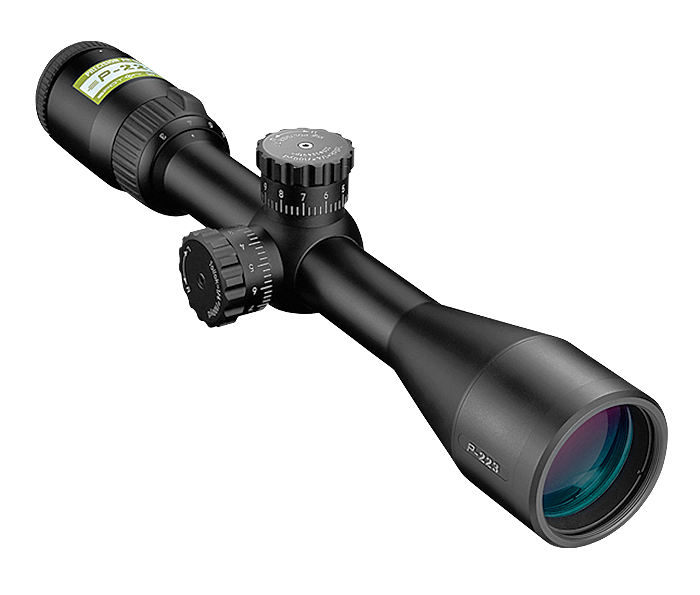 Zero-Reset Turret Feature: To simplify field adjustments, Nikon has integrated this feature into all new riflescopes. Just sight-in as usual, then lift the spring-loaded adjustment knob, rotate to your “zero”, and reengage. Field adjustments are now as simple as dialing-in your subsequent ranges. Waterproof/Fogproof: Nitrogen filled and O-ring sealed. LIFETIME REPAIR/REPLACEMENT – Excludes lost or stolen products and intentionally caused damage, and also excludes Nikon Rangefinders, Reflex Sights, Red Dot Sights, StabilEyes Binoculars & Specialty Optics.